For other uses, see Boxcar (disambiguation). A boxcar is the North American term for a railroad car that is enclosed and generally used to carry freight. The boxcar, while not the simplest freight car design, is probably the most versatile, since it can carry most loads. Boxcars have side doors of varying size and operation, and some include end doors and adjustable bulkheads to load very large items. Similar covered freight cars outside North America are covered goods wagons and, depending on the region, are called goods van (UK), louvre van (Australia), covered wagon (UIC and UK) or simply van (UIC and UK). Boxcars can carry most kinds of freight. Originally they were hand-loaded, but in more recent years mechanical assistance such as forklifts have been used to load and empty them faster. Their generalized design is still slower to load and unload than specialized designs of car, and this partially explains the decline in boxcar numbers since World War II. The other cause for this decline is the dramatic shift of waterborne cargo transport to container shipping. Effectively a boxcar without the wheels and chassis, a container is designed to be amenable to intermodal freight transport, whether by container ships, trucks or trains, and can be delivered door-to-door. Even loose loads such as coal, grain and ore can be carried in a boxcar with boards over the side door openings. Later grain transport would use metal reinforced cardboard which was nailed over the door and could be punctured by a grain auger for unloading. This was more common in earlier days; it was susceptible to losing much loading during the journey, and damaged the boxcar. [clarification needed] It was also impossible to mechanically load and unload. Grain can also be transported in boxcars designed specifically for that purpose; specialized equipment and procedures are required to load and unload the cars. However, grain is better transported in covered hopper cars. Livestock can be transported in boxcars, the standard practice in the U.S. until the mid-1880s. But, there is insufficient ventilation in warm weather. Specially-built stock cars or converted boxcars are preferable. Insulated boxcars are used for certain types of perishable loads that do not require the precise temperature control provided by a refrigerator car. Circuses used boxcars to transport their workers, supplies and animals to get from town to town. Box cars were used for bulk commodities such as coal, particularly in the Midwestern United States in the early 20th century. This use was sufficiently widespread that several companies developed competing box-car loaders to automate coal loading. By 1905, 350 to 400 such machines were in use, mostly at Midwestern coal mines. Historically automobiles were carried in boxcars. But during the 1960s specially built autoracks took over> These carried more cars in the same space and were easier to load and unload. The automotive parts business has always been a big user of boxcars. Larger capacity "high cube" cars evolved in the 1960s to meet needs of the auto parts industry. The most common boxcars are 50 ft 6 in (15.39 m) to 60 ft 9 in (18.52 m) in length, 9 ft 4 in (2.84 m) to 9 ft 6 in (2.90 m) wide, and 10 ft 10 in (3.30 m) to 11 ft 8 in (3.56 m) high. A hi-roof boxcar is 13 ft 0 in (3.96 m) in height. These are inside (interior) dimensions. Corresponding exterior dimensions would be 55 ft 5 in (16.89 m) to 67 ft 11 in (20.70 m) in length, and 10 ft 6 in (3.20 m) to 10 ft 8 in (3.25 m) in width. A double-door boxcar passes through Prairie du Chien, Wisconsin. A double-door boxcar has two sliding doors on each side instead of one. Double-door boxcars can be more convenient for household storage and passage uses. The double door gives the user a wider range of options than a standard one. Door-and-a-half cars were used on the PRR, N&W, B&O, WSS, and CNJ railroads since the smaller opening did not require as much inside bracing. In recent years, high cubic capacity (hicube) boxcars have become more common in the USA. These are taller than regular boxcars and as such can only run on routes with increased clearance (see loading gauge and structure gauge). The excess height section of the car end is often painted with a white band so as to be easily visible if wrongly assigned to a low-clearance line. The internal height of the 86-foot (26.21 m) hicube boxcars originally used in automotive parts service was generally 12 feet 9 inches (3.89 m). British soldiers on board a quarante et huit wagon in France in 1939. The stencilled sign in the top right of the picture says "HOMMES 40 : CHEVEAUX (en long) 8", meaning "Men 40 : Horses 8"
The boxcar has been used to carry passengers, especially during wartime. In both world wars, French boxcars known as forty-and-eights (40/8) were used as troop transports as well as for freight; in World War II first by the French forces, then the German, and finally the Allies. The shared experience among Allied soldiers spawned groups such as the Forty and Eight veterans organization. In addition to soldiers, the Germans transported prisoners in crowded boxcars during the Nazi regime, and an undisclosed number of German soldiers captured by the U.S. Army died of suffocation in American boxcars transporting them from the front-line to prisoner of war camps in March 1945. The same transportation was used by the Soviet Union during the 1930s and 1940s, when over 1.5 million people were transferred to Siberia and other areas from different countries and areas incorporated into the Soviet Union. 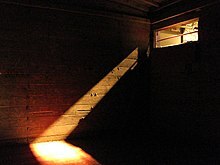 Hobos have often used boxcars in their journeys (see freighthopping), since they are enclosed and therefore they cannot be seen by railroad security or police, as well as being to some degree insulated from cold weather. ^ Affelder, William L. (March 1905). "Box-Car Loaders". Mines and Minerals. XXV (8): 372–377. Retrieved 2018-05-11. ^ "CSX Box Car Dimensions". OUPblog. CSX. November 12, 2008. Retrieved 2017-01-09. ^ "60 ft Hicube boxcar" (PDF). GBRX.com. ^ Chatfield, D. Scott (January 1994). "Athearn HO scale and Arnold N scale 86-foot box cars". Railmodel Journal. Denver, Colorado: Golden Bell Press. 5 (8): 32–39. ^ "A Number of German Prisoners Suffocate in U.S. Boxcars; Eisenhower Investigates". The New York Times. April 6, 1945. ^ "On Hobos, Hautboys, and Other Beaus". OUPblog. Oxford University Press. November 12, 2008. Retrieved 2009-08-05. This page was last edited on 23 March 2019, at 17:16 (UTC).